Wheat Germ Oil is extracted from wheat germ; it is a supplementation food high in unsaturated fatty acids and is one of the richest known sources of Vitamin E.
Acts as a tissue antioxidant helping to maintain healthy cells. Vitamin E in the product protects unsaturated fatty acids against oxidation in the body. Pure wheat germ oil with vitamin E.
Cold-pressed extraction method preserves more vitamin E than heat extraction method used by many manufacturers. Wheat Germ Oil is the finest variety of food grade wheat germ oil available - an oil that is rich in naturally occurring vitamin E as well as the essential unsaturated fatty acids, linoleic and linolenic. 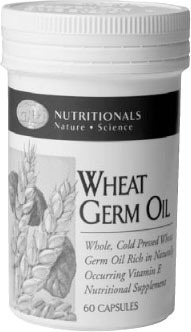 The body cannot manufacture these essential fatty acids or vitamin E. Thus, GNLD’s Wheat Germ Oil was developed to provide these vital nutrients in a convenient, easy to use form. *No SARDA established for this ingredient.